Presented here, a very special Betty Lamp. 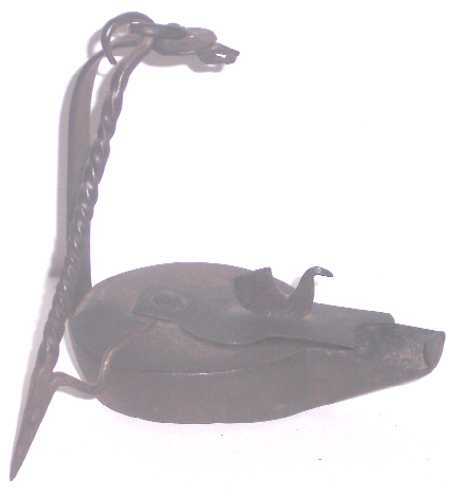 Unlike the so-called "miner's lamps" with the rooster finial, this one is made of sheet iron and has a somewhat fanciful bird as the finial. It has a wrought iron hanger assembly, and from the points of wear that are apparent and correct we would date this circa 1800. It is in excellent condition and most likely from Pennsylvania. A fine lamp in like condition. See p. 42-43 of the Rushlight Clubs' Early Lighting for similar examples.